TruLaw and our partner law firms will only be paid when we successfully find you justice. There is never a fee to use the Instant Case Evaluator or to discuss your legal rights with a TruLaw Case Manager or Lawyer. TruLaw partners with lawyers who, in our experience, give you the best chance at success in your lawsuit. The sooner you contact us, the sooner we can get started working for you. Of course, you don’t need to hire TruLaw. The Instant Case Evaluator, developed by lawyers, is available to you to use in the privacy of your own home whenever you want. Your information is private and will never be shared with anyone outside of TruLaw. We understand the hesitation to hire a lawyer immediately – it can seem like an overwhelming process to many. We are always available to talk to you about why we think TruLaw and our associated lawyers are best qualified to represent you, and we even let you know immediately if we believe you need to keep looking for another lawyer. We believe that transparency in hiring a lawyer is critical. For that reason, we recommend that you consider the following factors in hiring a lawyer to represent you. 1. What is your specific legal issue? What area of law are you looking for help in? If you are contacting a lawyer about a case that has been filed as a mass tort case and specifically a bad drug or defective product lawsuit, it is important that you ask that lawyer if they have been involved in cases like this before. Although mass tort cases are based on an injury, they are very complex and involve many plaintiffs. 2. Has this lawyer handled cases like this before? If so, how many? If you are looking for a lawyer to pursue a product liability case, you want to make sure that your lawyer has sued large drug and medical device companies before AND that they are working with a group of lawyers that represent a number of clients injured by the same product. Well-funded drug and medical device companies hire really great law firms to defend their products and they will use many resources to fight your case. It is important you have a lawyer that understands this. 3. 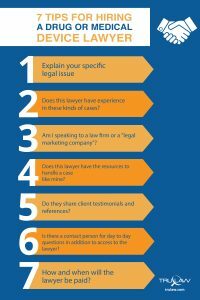 Am I speaking to a law firm or a “legal marketing company”? Unfortunately, the legal “client lead generation” has become a big business for non-lawyers. Today, many non-lawyer marketing companies make money by advertising for lawsuits, signing up clients who are unaware they are not speaking to a lawyer, and the marketing company then turns around and sells the client’s contract to a lawyer. There is currently nothing illegal about selling client contracts to lawyers. There is one very simple way for an injured individual to make sure that they are looking at a lawyer’s website…look at the bottom of the website. Does it have a disclaimer that tells you the lawyer that is ethically responsible for the content of the website? Does it tell you where the lawyer is licensed by the bar to practice? If not, you are not looking at a website that is run by a lawyer and it is very likely your case will be “sold” to another lawyer. Another way for you to be sure is to call and ask to speak to the lawyer. 4. Does this lawyer have the resources to handle a case like mine? Most of the cases that TruLaw pursues are products liability lawsuits. Product liability lawsuits seek to hold the manufacturer or seller of a defective product liable for the injuries experienced by an individual. They are very time-consuming and complex. In most cases, the manufacturer of the defective product is a well-funded corporation – either a pharmaceutical company or a medical device company and will spend a lot of time and money to defend their product. For that reason, it is critical that you understand that the lawyers you hire have the resources needed to be taken seriously. 5. Does this lawyer show testimonials or give out references from past clients? A lawyer that has had success in the past with cases like yours should have happy clients – so, ask to see testimonials from those clients. It’s also very important that you understand where those testimonials come from. If there are testimonials on a lawyer’s site, can you trace them to a reputable external authority or are these testimonials just hard written on the website? 6. Is there a contact person set up to answer questions on a day to day person, in addition to the lawyer, who may not be available all the time? You’re hiring a lawyer that is actively engaged in a very complex case that will require understanding how the product got to the market and when the company understood it was causing harm to individuals like you. A lawyer actively engaged in building a case like this will need to be traveling a lot and talking to experts of many kinds. For that reason, you will not always be able to speak directly to your attorney. It is critical that you have a contact person at the law firm who can be available for questions and to walk you through the process. TruLaw always provides the name, email and phone number of a legal assistant who is in constant contact with the lawyer in charge of the litigation. This is the person you can reach out to at any time. 7. How and when will the lawyer be paid? Your complex products liability case should be handled by a lawyer that does not charge you unless and until they are successful in getting you compensation. This kind of working arrangement is called a “contingency fee.” This is very important because you want to know that your lawyer is just as invested in the outcome of your case as you are. In addition, very few individuals could afford the hourly rate to hire a lawyer to pursue a lawsuit against a well-funded drug or medical device company.